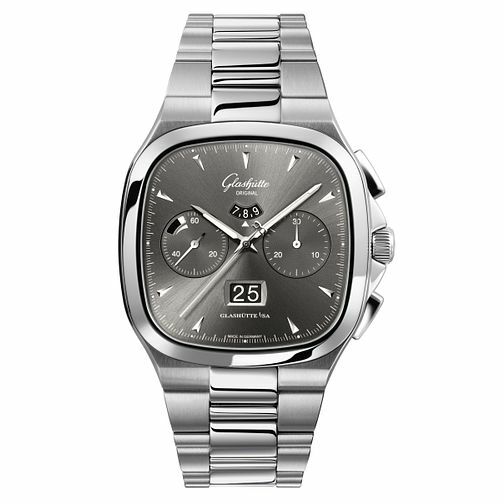 Glashutte evokes the spirit of the 1970s with this vintage timepiece, marked by its rounded and square case design that exhibits a broad grey dial with radial texture detailing and sharp indices. Two subdials sit near the centre and a numeric 12 hour counter. The large date aperture sits at the 6 o'clock mark for easier timekeeping. The watch features scratch-resistant sapphire crystal and features Glashutte Original automatic movement, with water resistance up to 100m. The timepiece finished with a stainless steel bracelet for more sophisticated and stylish wearing.